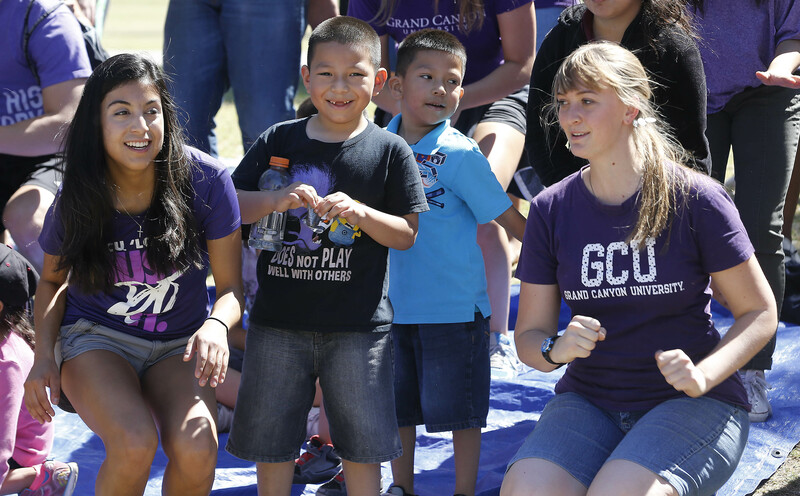 Neighborhood kids who take part in Canyon Kids love the back-and-forth with GCU students, such as Monique Aceves (rear). At 9 a.m. on a Saturday, while many of their peers at Grand Canyon University are slumbering or shaking off the night’s cobwebs, about 50 enthusiastic volunteers are hopping and bopping to Christian rap music. “Church clap let me hear the church clap (church clap). Church clap let me hear the church clap (church clap),” they chant as Evan Fallon, filling in for absent leader Joe Koetter, cavorts and croons in the lobby of Cypress Hall. They are getting ready to leave campus to gather, shepherd-like, children ages 3-15 for a morning of Bible verses, games, crafts and skits at nearby parks during the school year in a weekly ministry program called Canyon Kids. 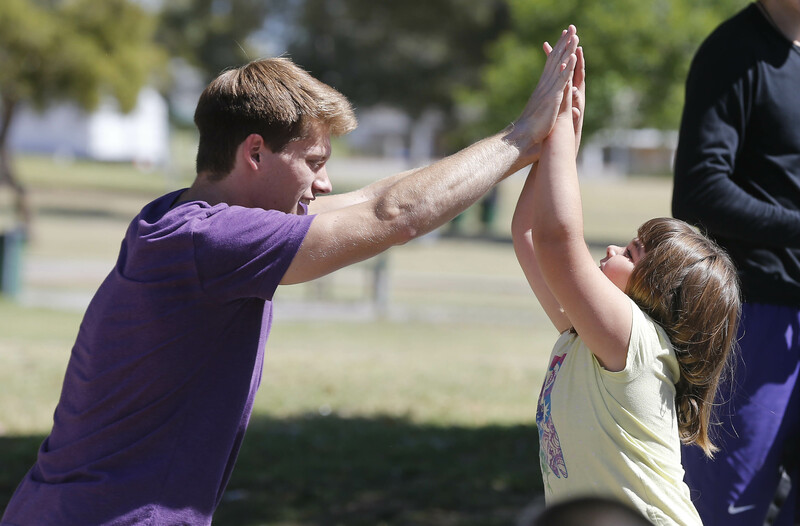 Canyon Kids provides positive moments. 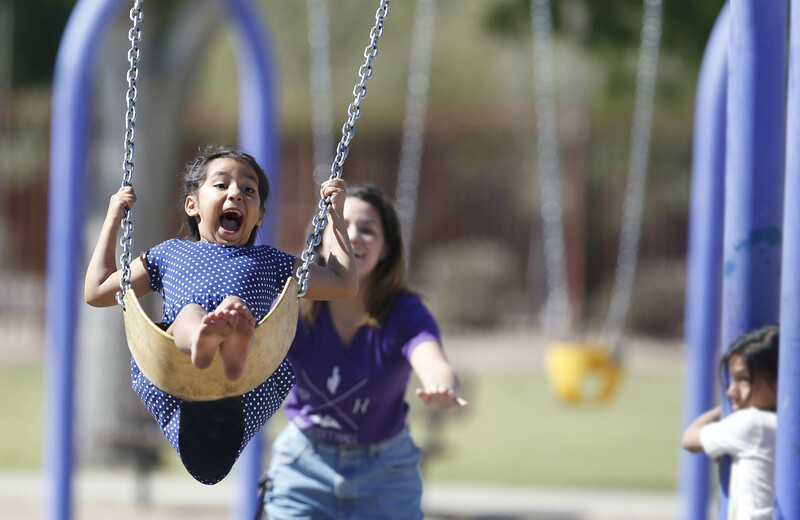 The rap is the energetic beginning of a ritual that for many is the highlight of their week: bringing joy and ministry to a rapidly growing population of children who live in the neighborhoods surrounding GCU. 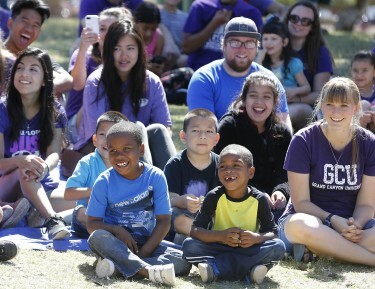 What started as a handful of Department of Spiritual Life volunteers working with a small group of kids in Little Canyon Park has blossomed today into a vital ministry with dozens of GCU students and more than 100 children in two parks, said Jaci Curran, Spiritual Life outreach coordinator. The Canyon Kids program is so successful, this year organizers began a new outreach in Cielito Park. Lord and who are Christ-centered and instill Biblical truths into the kids,” said Yvanna Rodriguez, a student leader. Already, parents and children are flocking to the fledgling Cielito Park program, which started this year. From 15 children the first week, the number sprang to 45 by week four and is still growing, Rodriguez said. After the hip hop, the volunteers split into two groups. Rodriguez and others knock on doors as they make their way, Pied Piper style, to Cielito Park. To build a critical mass of children for the new arm of the ministry, volunteers went door to door to every house near the park, brochures and permission slips in hand, to invite children to Canyon Kids. “At first, everyone was kind of shy, reserved,” Rodriguez said of the children. But many — such as the three Vazquez sisters, Romina, 6, Mariana, 8, and Brianda, 11 — are waiting outside their homes for the weekly visit. Ponytails bouncing, they rush to hug their GCU friends. Their mother, Alma, waves goodbye. That parents like Alma are content to watch their children walk down the street with GCU students is a testament to the level of trust the Canyon Kids program instills. Laughter, chatter and shouts of joy fill the air as kids arrive at the park. Some kick a soccer ball and play hopscotch while others make for the swings and slides. Some cluster around a handful of picnic tables and play with chalk and nail polish. Canyon Kids neighborhood ministry in action. For the arts and crafts project, the children paste together a construction paper shield with a cross and a copy of the verse. For the skit, volunteers Josh Micko, Steven Culebro and Kayla Michaels brainstorm under a tree. The hiker goes the hard way and stumbles. But because “the Lord is our shield, Jesus is our shield,” the hiker recovers his footing and the way becomes clear, Micko suggested. Christian Barrow, who happened to be in the park with her children, Alison, 5, and Romel, 2½, strode over to request a permission slip. Over at Little Canyon Park, Fallon sits cross-legged in the grass surrounded by more than a dozen children who are munching on fruit snacks. The smiles on their faces tell how much they enjoy Canyon Kids. The words are music to the ears of junior nursing student Olivia Meek. Britannee Carranza, a junior justice studies student, said she had to skip a few Saturdays and noticed the difference. And watching them get the Word is even cooler. Frankie Davis, 9, was asked if his shield is protecting him. Contact Laurie Merrill at (602) 639-6511 or @laurie.merrill@gcu.edu.